Tim Crowe – Crowes Cabinets, Inc. I was involved with full time production on a day-to-day basis through junior high and high school, right through my major life events including college, marriage, and the birth of our children. I am proud to say that most of the guys who started at the same time I did are still working for Crowe’s Cabinets, more than 20 years later. I know them, their families, and their dedication to producing the best quality work for our clients, because this is a family-run business, now on its second generation of ownership. We pride ourselves on dedication to our employees, and are humbled by the dedication they have shown to us. 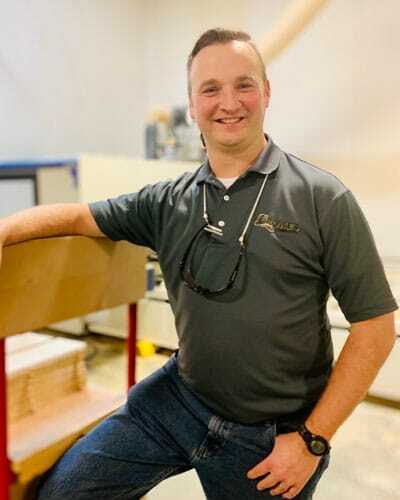 As a cabinet maker and business owner, I believe that we are here to make each client’s life easier. That is my focus, and I am confident that everyone else in the organization is committed to delivering on that same expectation. On every project that comes through our door, I ensure that our team is dedicated to delivering the project on time and ahead of schedule. From day one the belief has always been to deliver what the customer wants, when they want it, and at a fair price. Whether it’s a commercial or residential project, we deliver. And proof is in the fact that a good deal of our customers come back to us time and again, and become lifelong clients of Crowe’s. They come to feel more like family members than just customers. As the president of this company I am deeply committed to our customers, the people that are part of our organization, vendors we do business with, and the community. When I’m not at work I’m actively involved in the Poland Rotary Club, I enjoy family, playing soccer competitively, cooking BBQ on the smoker, relaxing with friends, and an occasional round of golf.